First off, thanks to everyone for their patience while I was away, and as I continue to work on getting my computer repaired. 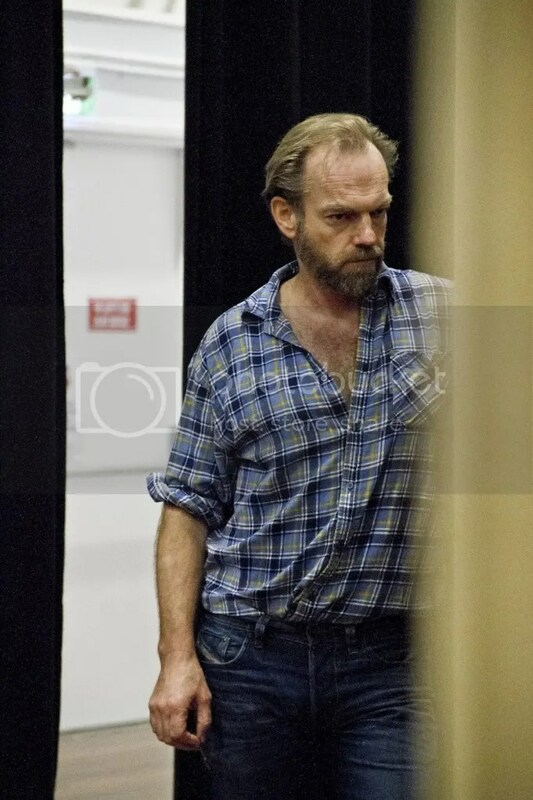 As I mentioned last time, Hugo Weaving and several castmates from STC’s Uncle Vanya were nominated for Helen Hayes theatre awards for their performances in the Washington DC run of the production. As many of you probably already know, Hugo indeed won the award for Best Supporting Performance in a Non-Resident Production. (Cate Blanchett took honors for Best Actress.) Of course, neither was able to pick up the award in person; Hugo continues his two-month run in Les Liaisons Dangereuses in Sydney while Cate continues touring in a different production, STC’s Gross Und Klein, in London. You can read more on the Helen Hayes Awards at Variety, The Sydney Morning Herald, The Daily Telegraph, Theatre People, Theater Mania, The Australian, and ContactMusic. 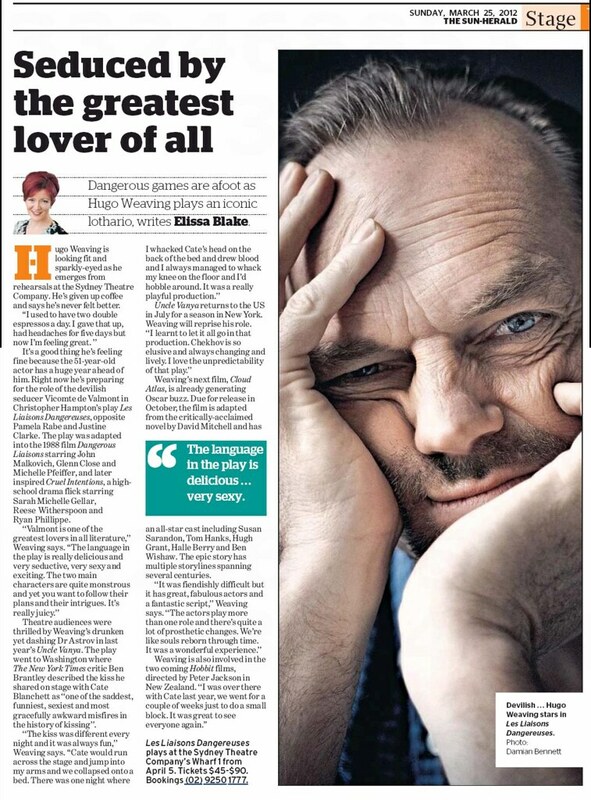 The Sydney Morning Herald piece included this lovely new photo of Hugo by James Brickwood, presumably taken during rehearsals for Les Liaisons Dangereuses. Next, and possibly even more of a boon for fans, was the posting online of Elissa Blake’s full interview transcript of her conversation with Hugo during Liaisons rehearsals. While some of this material was posted in the Sydney Morning Herald and Herald Sun on 25 March and 3 April, a lot of it wasn’t, and a lot of what was was edited for space and succinctness. While this is standard practice in journalism, and Blake edited her interview judiciously, she’s done Hugo’s fans a great service by posting the full test to her blog, along with a great new photo of Hugo (below). Hugo doesn’t really speak in sound-bites; he gives answers full of thoughtful pauses, reflection and depth. His longer radio interviews are defined by these qualities, and by sharing what Hugo actually said in full, Blake allows us to better “hear his voice”, so to speak. I won’t copy the full text here, and a lot of it was already printed in the published pieces I mentioned, but I’ll give you a few excerpts, and you really should read the whole thing at her blog. (I know some of you probably have already.) 😉 It’s one of the most gratifying, in-depth Hugo interviews in the past few years, from an interviewer who understands what’s really important to him. Comments in brackets are mine. “…Well, this is a huge film that’s directed by Lana and Andrew Wachowski, who directed The Matrix and V For Vendetta that I did, and also Thom Tykwer, who’s a German director – he directed a film called Run Lola Run, amongst other films – and you know from the book there’s six separate stories, so – it’s a huge cast. We filmed it in Berlin and Majorca and Glasgow and in Saxony, but mostly in Berlin, and the six stories take place in different time zones, different geographies, but they’re told more like in a mosaic way rather than the way they are in the book, and the actors were playing more than one role, so many of us had one role in each story and it’s like souls reborn through time, which is sort of suggested in the book…. “HW: Well, I was over there [in New Zealand] with Cate last year – we went for a couple of weeks around the same time just to do a small block. So, yeah, great to go back there again and see everyone. I think they’re still filming – they had a little period off and then went back into it, and they’re still all over there now. EB: Will there be two Hobbit films? EB: And will you be in both of those? EB: Peter Jackson has released a few small videos of how it’s going on and Ian McKellen was saying that they’re all “happy actors cavorting around” (laughs). Did you feel like there was a lot of cavorting? HW: It’s easy to cavort with Ian. He’s great. Yeah, they’d only really just begun, actually, when I was there, so – the dwarves were – they were getting used to dealing with the full-on preparation for each day, to get into these massive suits, prosthetic was really hard for some of them, I think, to sit in that every day. So that was something they were dealing with, but they were cavorting as much within that as they could, and enjoying themselves; good group of people. And Ian was – it was lovely to sort of see him again. But I was only really there for about three weeks, I think. So we’ll see whether I have to go back for any hiccoughs or not this year, or next year, I don’t know, but I suspect, knowing Peter, that that’s what will happen. EB: So that whole series, that’s been enjoyable for you to work on that? “EB: Will there be any more superheroes? HW: No, I don’t think so. EB: You’ve finished with that? 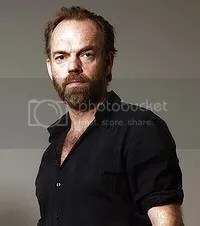 HW: After this – after about five weeks we go Uncle Vanya in New York and there’s a film, hopefully, which will be happening in Australia after that, but it just depends on – it’s a film that’s been floating around for a little while, so whether that happens or not I don’t know. Hopefully. EB: And maybe a stage work next year? “We were up at the farm [in Hunter Valley] about three weeks ago, just before we started this play. Katrina [Greenwood, his partner] and I were up there for about five or six days and just lots of – planted a whole lot of spotted gums, which is good, and put in another – we planted a walnut tree, actually, which is a bit bizarre because it’s not…native, but kind of interesting in that particular spot. And our macadamias are going so well up there, and the fig tree’s going so well, so we thought we may as well put in some other nut trees, so we put a walnut in and a hazelnut tree…. [W]e flood up there regularly. It doesn’t affect the house– [it’s] just above the river, but it absolutely – no, we’ve been stuck up there a number of times, not able to get out. The bridge just before our property on the Williams River goes under in a flood – it’s designed to. So we’ve been cut off – I haven’t been able to get back for a couple of things on occasions. EB: Has that been worrying? Finally, there’s a new review of Les Liaisons Dangereuses at Northside Magazine online, which includes an interesting account of the actors’ professionalism during technical difficulties.